Sorry for the double post, but I started playing this hack finally and I'm enjoying it! 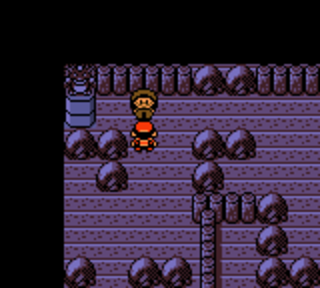 I'm currently in Goldenrod, I haven't fought Whitney; I'm taking a break from looking for the 1% Yanma chance. I noticed a couple tiny issues while playing so far and I thought I'd report them. On Route 30, before you give Elm the Egg, if you talk to the two trainers blocking the path to Violet, their Pokémon sprites glitch out for a moment during the overworld battle (this is the only time I've seen something like this, I'm playing 1.1.2). Also, an NPC in the Goldenrod Dept. Store mentions using his X Special, when you changed the name to X Spcl.Atk. Neither of these are major issues but I thought they were worth reporting. Thanks, Mmmmmm. Those last couple sprite glitches are already fixed in the next release, and I fixed the X Special name just now. Sorry, but I have no plans to give the Kanto starters that early, or to add a new team. You can catch all three Johto starters in Yellow Forest, and the Kanto ones in the Safari Zone. If you really want a Charmander, use the Gameshark code 010409D2 to find them in the wild. I'm not going to publish a whole list of modified codes (yet) because new features keep changing the memory addresses. 1. Build the pokecrystal ROM, which will create a file called pokecrystal.sym. 2. Build Polished Crystal, which will create polishedcrystal.sym. 3. Take a normal Crystal code, like 01xx04D2 for catching wild Pokémon. 4. Find the address D204 in pokecrystal.sym. Turns out that address is for the variable TempEnemyMonSpecies. 5. Find the name TempEnemyMonSpecies in polishedcrystal.sym. Turns out it's at address D209. 6. Now your modified code is 01xx09D2. 7. Use the game data files to find ID values for Pokémon, moves, and items. I have a few more issues with the hack to report; I just beat Morty and haven't investigated anything to the left of Ecruteak, to give a mark of my progress. In National Park, when you talk with Jack after the battle, he mentions there being 50 TMs, when you changed it to 65. I'm not sure if it's intentional, but you can get multiple Eviolite from the lady in the Comm. Center in Goldenrod by getting multiple Eon Mail. If it is intentional, I think the dialogue could be changed to better reflect that, just because it sounds as if the lady has a one-time problem and not an ongoing exchange. This is just my opinion but I think the teambuilding on the routes between Goldenrod and Ecruteak is sloppy. You have a Firebreather with two Magmar next to an Officer with two Growlithe on Route 35, which would be fine on its own, but then you have two trainers with a Growlithe and Vulpix respectively in National Park. I feel changing those last two to something else, or moving them to a route further away, would improve the variety of that section. There's also a pair of twins with a Jigglypuff and Clefairy on their team, but then right after that there are two unavoidable Beauties who both have the same team of Clefable and Wigglytuff. If you reduced it to one Beauty, or gave each of them only one of the two, it would reduce redundancy. I also strongly recommend revamping the trainer teams in Ecruteak. It seems like you haven't altered them from the original besides the Gym Leader, but none of them use Pokémon that aren't Gastly or Haunter, and one of them has five Gastly. I feel like they should have less Pokémon altogether, and some of them replaced with Misdreavus or possibly Dark-types like Houndour or Murkrow. I also think cutting Morty down to five Pokémon would improve his team, either removing the Gastly or one of the Haunters. Also, I love that you added the Hex Maniac to the game because she's best girl and Gen 3 is the best version of her, but her front-facing overworld sprite seems a bit weird. What are the lines on her face? If this post sounds negative I want to assure you I'm enjoying the hack very much, I just tend to be critical about things I enjoy, especially if it's an in-progress hack like this where people's criticism may improve future versions. EDIT: Also, how does Yanma evolve? The github says I just need Ancientpower, but I learned it two levels ago and nothing's happened. EDIT2: Never mind, it suddenly evolved now at Level 37. Mmmmmm, thanks for the detailed bug reports! This is how the next version will be even better. I've just fixed most of that, including the multiple Eviolites. The twins in HG/SS had Marill and Mareep instead of Clefairy and Jigglypuff; I guess Game Freak noticed the same issue, so I've copied them. Dark is associated with evil in the Japanese versions, and I've given Dark Pokémon to Team Rocket, but Ecruteak Gym does now use Misdreavus too (and some Fire types, since the Burned Tower is right there). Falkner has three Pokémon, Bugsy four, Whitney five, and the rest of the Gym Leaders have six. At first it was Falkner four, Bugsy five, everyone else six, but I thought that would encourage overleveling. Those lines are supposed to be the bags under her eyes. Yanma still evolves at level 37 in 1.1.2. The next version will introduce evolve-by-AncientPower, as well as a custom method of evolving trade evolutions—give them enough stat exp. I figured it might have been circles under the eyes, but the way it bridges across the entire face made it seem like it could be glasses or something. I'm not a spriter but maybe something like this would be clearer. Heh, it was glasses until I realized the full trainer sprite just had her eyes rolled backwards. That edit looks fine. Just beat Jasmine, have a few more things to say at this point. I think Jasmine having two Magnemite and a Magneton is a bit redundant. I know you want later Gym Leaders to have six Pokémon each and there are slim pickings regarding Steel-types in Gen 2, but Forretress could be a good substitute to one of the Magnemite if you didn't object to the overlap with Koga, or even Ampharos since she takes care of it in the lighthouse. The overall levels on the grunts feel too low in Route 47. There were wild Pokémon in that area stronger than some of the grunts. I like Yellow Forest for the most part, but I feel having a waterfall and the ability to Surf to that waterfall, but then blocking it, is a bad choice. I understand the reasoning behind it, since you don't have any special kind of code to let you pass under bridges (and I can't code so I wouldn't know how to help you) but I think you should remove the ability to enter that pool of water if you're going to block the waterfall, or unblock the waterfall and put some small area between it and the bridge with an item that you can only access by climbing it. This is a minor complaint though, entirely based on aesthetics. I know Route 47 has a similar blockade, but I think it works fine there because it's further away from the waterfall and because there are things to do in that pool of water unrelated to the waterfall (since Quiet Cave is there). I'm actually impressed at how well Routes 47 and 48 translated to GSC without the ability to go under bridges or climb waterfalls, it feels very professional. I also got this text error after defeating Jasmine, I'm not sure if you fixed this yet. One QoL feature I think would improve future versions of Polished Crystal would be porting TPP Anniversary Crystal's feature where you can switch boxes when Bill calls you and tells you the current one is full, I've been catching every new Pokémon I run across and running back to the nearest town when I fill a box has been annoying. Jasmine does use Ampharos when you rematch her, but I think of Forretress as Koga's signature Pokémon. Then again, it would be her only Bug. I added the Steel type to Blastoise and Magmortar, so maybe she could use those. (Another consideration is that when I add Steven I want him to differ from Jasmine. I could give her a Rock-type, since that's what she reportedly used before switching to Steel, but Steven uses those too...) Is there at least one more Pokémon that could sensibly be a Steel type? Not Electrode, one Electric/Steel type is enough. I'm already reconsidering Magmortar. I'll keep the Grunts in mind when tuning the levels. Yeah, I was frustrated with the lack of GSC bridge support when I was laying those out. However, I did try adding a little platform in Yellow Forest, which will probably be in the next release. It doesn't quite follow the conventions of GSC maps, but I like it anyway. A good place for the Poké Doll. The TPP source code says that feature is "mostly functional but glitches pokegear map graphics". It is nice to have, though, and something I wanted to add eventually, so maybe that's fixable. Jasmine and Chuck had similar text errors, both fixed already. Hey! Can you tell me what pokemon bill grandfather asks to show him at first time i am thinking a lot on it but i can't guess. However loving this game so far i beat jasmine and now moving further to beat team rocket. Look on the adjacent routes, there's a Pokémon in the wild that fits his description. I have seen the same dialogue problem after beating the pryce the seventh gym as seen after beating jasmine. I don't now whether you have fixed it so i just informed it. Thank you, Pryce's dialog is fixed now. I also just finished adapting HG/SS's Route 45, with a river running down the canyon. Here's the map. It's look great! I liked the new graphics added by you at the yellow forest too. In the radio tower when the lady gives you the bow she says it power up normal but info shows fairy. This sounds great except my boy Spearow going missing... Also, just out of curiosity, why did you go with rev 1.0 instead of 1.1? Sorry for not reporting in, I've been busy so I've only played up to the radio tower so far. I noticed a couple changes you could do that might make rare Pokémon a bit more available without ruining their rarity. Yanma only has a 1% catch rate on a single route when it's not swarming, but it's also right next to National Park. Have you considered putting Yanma in as a possible encounter in the Bug-Catching Contest? I also noticed 2/3rds of the headbutt trees have Hoothoot in them; I had a hard time getting Murkrow due to its encounter rate and only being available at night, but I think adding it as a headbutt encounter over Hoothoot, maybe only on certain trees like Heracross, would give players an alternate method of catching it if they don't want to wait until nighttime. I noticed a couple grunts in Mahogany's Rocket Hideout have Pokémon below Level 20, which is definitely below the level curve since that area is blocked off until after the events in Cianwood/Olivine. I probably sound like a broken record with how many times I complain about trainers having too many Pokémon, but I think Silver should only have five Pokémon in the Underground. I haven't gotten to Victory Road yet so maybe you already figured something out to mitigate my concern, but when he already has a full team I think it's difficult to make the climactic Victory Road battle a step up from past encounters; you're meant to battle your rival throughout the game and they gradually get more powerful until they're at their full strength in the final battle (though Silver is already a slight exception since you fight him several times in Kanto), and I just think having a full team so early takes away some of that buildup. He has several NFEs that he can evolve still, but that's not really as large a step-up as having a full battle, which are rare in the vanilla games. It's not an issue with his team composition like I had with Morty or Jasmine, but one of keeping the themes of your rival getting stronger with you more intact. Some of the Rockets in the Radio Tower also have odd level choice. The one that mostly stuck out to me is Ariana; she's meant to be the second-in-command and the penultimate trainer in the tower, but her Pokémon are like five levels lower than some of the ones used by grunts earlier in the tower and around ten levels lower than Archer's ace. EDIT: I just ran into Raikou and it uses the Kanto Legend theme instead of the Beast Trio theme. Making a double post just because I don't want to make the first one too long with editing. I got to Silver in Victory Road and he didn't feel like that large a step up like I feared, especially with all the 6v6 battles leading up to him. I am glad you put trainers in Victory Road though, it was too empty in the original. When I fought Lance, and he pulled out his ace, he wasted a turn using an X Sp. Atk and I was able to one-shot him, even though it would have outsped and probably one-shot my Pokémon. I think he'd be better off if you just gave him Full Restores so he doesn't waste turns on this. There were text-wrapping issues in the Sandstorm house and Gaven's post-battle dialogue where he asks for your phone number. Still though, I beat the Elite Four!